Pyrons from Yggdrasil Gaming engages video slots players by offering some incendiary excitement. This dynamic game furnishes five reels and 20 paylines. It departs from traditional Vegas-style slots, however, because the three rows of icons filling the reels behave in an explosive manner. 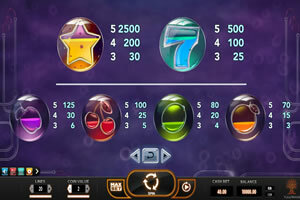 With six different symbols yielding jackpots if three or more identical icons line up across a single payline, the game offers players a chance to win frequently. Winning combinations literally combust and disappear from the screen. When this happens, instead of the reels turning, icons on the screen fall down from above to fill any vacant spots below, offering additional chances to win. Then fresh symbols materialize at the top of the screen to fill up the recently emptied upper rows. This sticky quality of the screen and the frequently explosive movements of the game icons lend a visually captivating quality to this game! Bonus play continues until the player finally loses a round. With each win, the game progresses through multiplier level rounds, potentially advancing 2x, 3x, 5x all the way to a staggering 20x level in this online slot. Pyrons employs a theme of fire-starting combustible liquids throughout the game screen. A purple background clearly displays the icons. The designers used traditional symbols associated with fruit games, such as apples, oranges, cherries, limes, yellow stars, and big blue sevens, yet with a twist. Every symbol appears semi-transparent, and appears to contain a quantity of liquid inside it. Glass balls contain each of the liquid-filled game symbols. As events within the game intensify and players reach higher bonus round levels, the liquids inside the icons on the screen appear to froth and boil. By the time a player reaches the 20x multiplier level, even the edges of the screen blaze with flashes of white electricity-like illumination. The incendiary visual imagery conjured by Pyrons conveys an undercurrent of tension and heat. 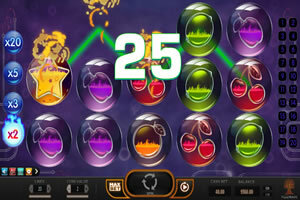 Players obtain an opportunity to win 2,500 coins by lining up five star symbols across a single activated payline. 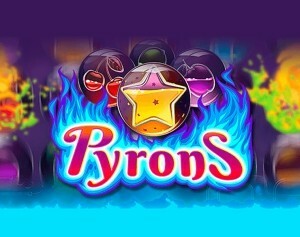 Since the game accepts up to 20 coins per spin, Pyrons can require disciplined management of a bankrolls by a player. The bonus rounds offer incentives to keep playing. 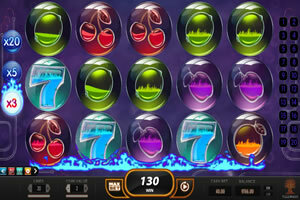 Sound effects complement the excellent graphics of this Yggdrasil Gaming video slots. As the icons fall into place, players hear light tinkling tones of glass colliding. When wins occur and winning combinations explode, they disappear from the screen with the sounds of hissing and fizzing, and occasional crackling flames. Yggdrasil‘s very talented design team has utilized an underlying pyromaniac theme in both visual and sound effects, and has linked the level of some of these features to the course of the game. When players reach multiplier rounds, an on-screen scale clearly indicates the level of play. The vivid visual imagery in Pyrons and the sticky screen sets this game apart from typical fruit video slots games. With the lure of progressively more attractive bonus round multipliers awaiting after a win, some players may keep playing for extended sessions of video slots play once they commence a Pyrons game. Possibly the incendiary, fire-starting theme will not appeal to all players, however. For people who enjoy fruit game slots, Pyrons certainly offers a unique perspective and some very different sound and visual effects.